T. A. Pai Management Institute (TAPMI), Manipal acknowledging the criticality of Information Technology in today’s business, organized its first ever Information Technology Summit in the campus on Oct 20. 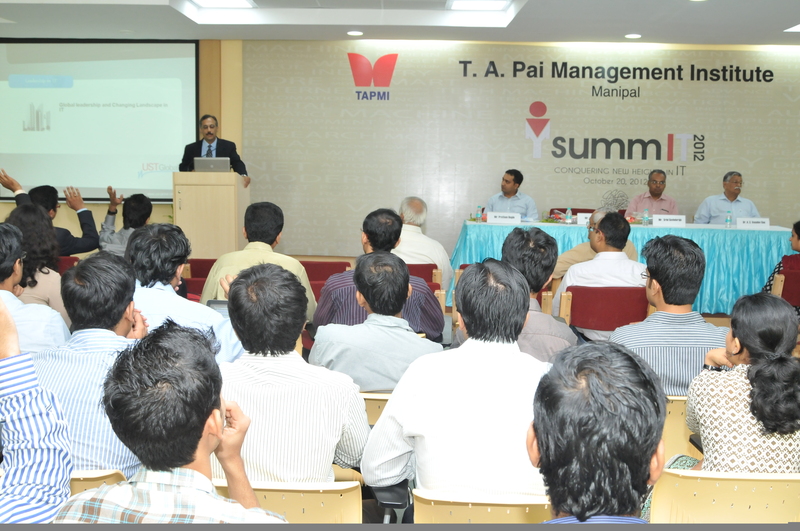 SummIT 2012, witnessed presence of big names in the IT industry, both from private organizations and government regulators who shared their knowledge and experience with enthusiastic future managers from TAPMI. Eminent personalities such as Sri Vidyashankar, IAS, Principal Secretary to the Govt of Karnataka, Ministry of Industry & Commerce, Mr Alex Varghese - Country Head India, UST Global, Mr Srini Govindaraju, Senior V.P., Lister Tech, Chennai, Mr. Pratham Hegde, Vice President, Genpact, Bengaluru, India and Ms. Poornima Shenoy, Founder & CEO, Latitude Edutech Consulting Pvt. Ltd enthusiastically participated in the conclave whose underlying message was the transformation of IT from being an enabler to becoming an industry driver. The same was highlighted by Mr Alex Varghese, who vividly described the growth of his organization from being a 14 member firm to a 9000+ behemoth. He mentioned how India, initially viewed as centre for cost arbitrage, has metamorphised into a mature service provider for the world. Mr Varghese also talked about the accompanying challenges in this transformation like attrition, inflation, immigration policies and talent crunch and how the industry can effectively combat them. Mr Alex Varghese concluded his session by stressing on the importance of building businesses with the foundation of value systems like humanity, humility and integrity and also how it can be made effective by aligning the workforce to the organization’s mission and vision. Mr Varghese was followed by Mr Pratham Hegde, VP of Genpact Analytics who underscored the importance of analytics in today’s business world. Not only was his session informative, but the fact that he is an alumni from TAPMI made it all the more interesting. The lecture demystified analytics for the responsive audience and demonstrated the problem solving ability of business analytics. One of the highlights of SummIT 2012, was the session by Sri Vidyashankar, IAS, Principal Secretary to the Government of Karnataka, Ministry of Industry & Commerce. He spoke on the impact of IT in Governance and Environment and how it is affecting the citizens of our country. Taking the example of the various E-governance initiatives, he described how they have been a mixed bag in terms of success and failure. He described how the Government of India, being one of the largest procurers of goods and services, has a massive need for the implementation of IT in order to increase transparency and improve efficiency. He educated the audience on the nittie gritties of e-tendering, a component of procurement and how it integrates and improves the transparency in any system. He also cited examples such as Aadhar and how more information leads to greater accountability. However, he also gave examples of certain failures, which induced dissastisfaction of the stakeholders, thus highlighting the fact, there is still a long way to go.